Researchers at the Mayo Clinic compiled data from 11 studies and included more than 600,000 people worldwide and reported a correlation between larger waist circumferences and premature deaths. Individuals with larger waistlines were also more likely to suffer from heart disease, lung disorders and certain types of cancer. Waistline measurements were found to be more predictive of death and disease than Body Mass Index (BMI) values, which are more routinely used to assess one’s body weight and fatness. The researchers found that women with waistlines of 37 inches or more had an 80 percent higher risk of death than those with waists of 27 inches or less, which equated to a five-year lower life expectancy after age 40. Men with waists of 43 inches or more had a 50 percent higher risk of death than those with waists less than 35 inches. Large waistlines proved to be detrimental for one’s health, even if BMI values were considered normal. In addition, every two-inch increase in one’s waistline was associated with a 9 percent increase in mortality for women and 7 percent increase in mortality for men. The researchers recommend that waist circumference measurements be used with BMI values to assess and individual’s health status. Several studies have previously suggested that waist circumference is a more critical measurement when it comes to assessing health risks, compared to BMI values. This is because waistlines are an indirect measurement of harmful visceral fat that’s linked to heart disease, type 2 diabetes and more. Researchers at St. Luke’s Roosevelt Obesity Research Center in New York found that women who had a waist greater than 33 inches were at increased risk for disease and men with waistlines over 40 inches are also at increased risk. 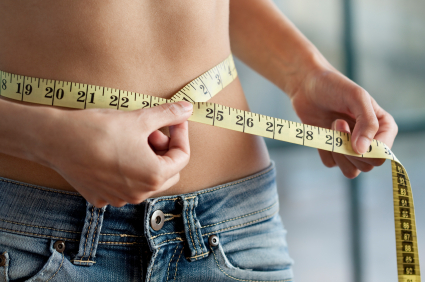 Bottom line: Reducing inches from your waistline can help ensure a longer, healthier life. To measure your waist, a tape measure should be snug horizontally around the level of the top of your iliac crest or hipbones where your waist would be narrowest. Take the measurement at the end of a normal breath. For your BMI, use this calculator from the National Institutes of Health. For more tools to find your perfect weight, read this.